The other day I awoke to a misty morning down in the hollow and it reminded me of the old Ozarkian saying that “the fogs of August are the snows of winter.” Naturally, this led my mind to the legendary snow of March, 1968 when my mother was eight months pregnant and living in an apartment on Spring Street. She was afraid that if she went into labor, transportation would be an issue. I’ve heard and read that local snow fall amounts ranged from 16 to 24 inches, but the main problem was a driving wind that created snow drifts of mind-boggling depths. I did some research trying to ascertain if the old stories were true and found a reference to the snow storm on the front page of the March 13, 1968 Northwest Arkansas Times. It says, in part, that “highway department workers attempting to clear a lane between Berryville and Eureka Springs drove a snow plow into a 17 foot drift.” The massive snowdrift was at the top of Bluebird Hill and the plow became stuck, as did the road grader that came to the rescue. 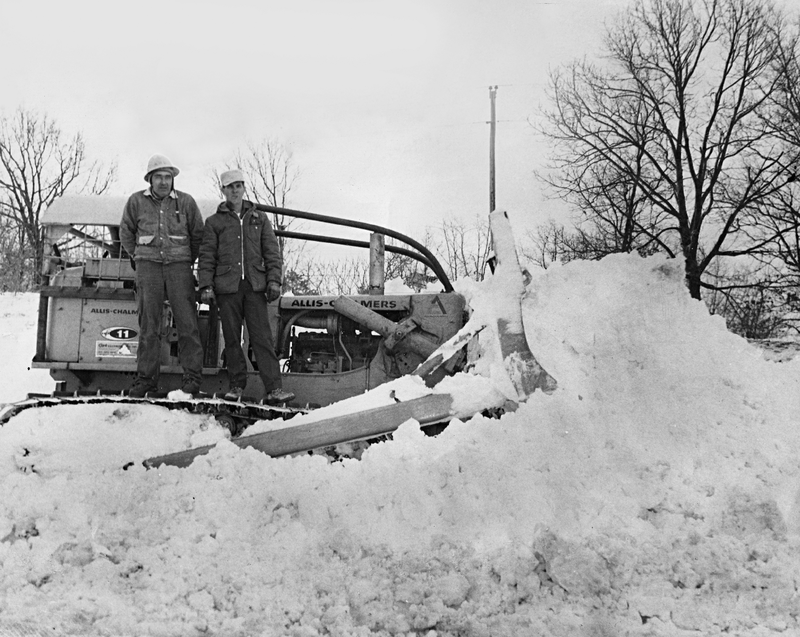 That morning, Mac Weems was driving to a bulldozing job and encountered the “commotion” on Highway 62 caused by the snowdrift. He turned around and drove down the Old Berryville Highway (now County Road 306, though the bridge that was there then has since fallen into Kings River) to James Garrett’s shop, where his big Allis-Chalmers bulldozer was stored. Later, the area Arkansas Highway Department foreman caught up with Mac and asked if he would get the two graders out and clear the snow drift. Not having his truck and trailer, he had to drive the dozer at a slow crawl up Highway 62 from near Kings River to the top of the hill. He says the hard part of clearing the drift was being careful not to hook the abandoned cars buried under the snow with the dozer blade. It took awhile, but he was able to clean it up and drove the bulldozer home to his house in Eureka, clearing a few driveways along the way. 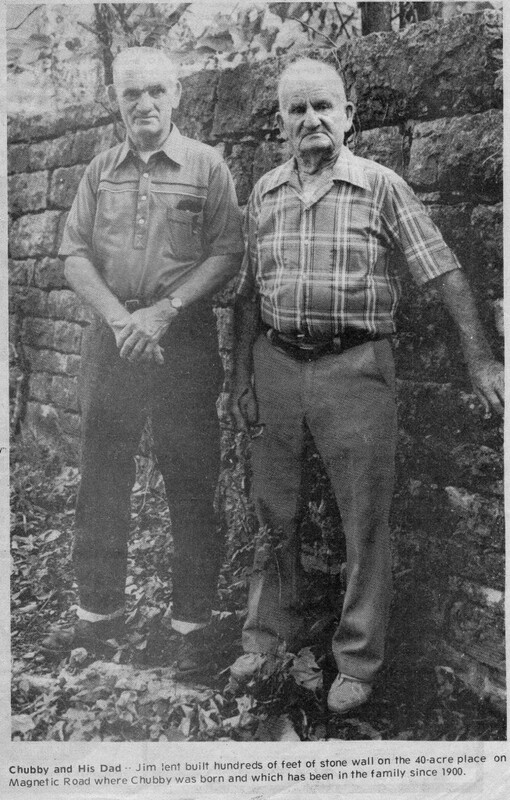 From the September 13, 1984 edition of the Eureka Springs Times-Echo newspaper. Often known as Chub or Chubby, Bob Lent was a well known figure around Eureka Springs, especially during his years as a mail carrier. He was also known for a speech impediment; when he ordered a cup of coffee it sounded more like he wanted a “chup of choffee.” Bob Lent was born in his parent’s home on Magnetic Road and lived there nearly his entire life. As a young man, he worked several years for Britton Baker at the Esso station where Spring and Main meet (now the location of Scarlett’s Lingerie). When he left the Esso station, Mr. Baker gave him a watch as a gift, the same watch that took the brunt of an enemy bullet in Korea and probably saved his arm. Chub made sergeant during the Korean War because, he said, when everyone else gets shot and you’re left, they make you the sergeant. In the 1960s, Chub spent time in the tuberculosis sanitarium near Booneville and ended up losing a lung. He had only one lung all those years he delivered the mail, walking up to 12 miles per day. While a letter carrier, Chub was caught disposing of junk mail that he didn’t think his postal customers would want. He got in a lot of trouble and even hired an attorney to represent him. It made no difference and he was fired. Immediately, many locals came to his defense. My understanding is that Chub felt it was the involvement of John Cross that got him back his job at the post office. Near the end of his life, he allowed a business I was involved with to put up a sign on the Lent property. When I inquired how much the sign rent would be, he responded zero, so I mailed him a printed and signed business check made out for $0.00. He had a lot of fun going to banks and trying to get the check cashed. I am told it was folded up in his wallet when he died August 11, 1994. 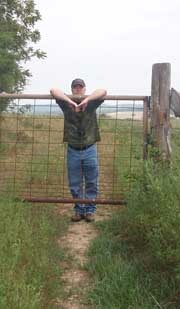 He is buried in the Eureka Springs IOOF Cemetery under a tombstone that reads Charles Robert Lent. I never knew his name was Charles until I saw it on the grave marker. “All of them,” he answered. That didn’t clarify matters much, but I decided it really wasn’t my business anyway. A deceased lady known for her kindness, writing, and love of Eureka Springs and the Ozarks; I can’t help but feel that I should be on her team. The tone of her writing was usually both eager and earnest, sometimes even breathless, like she couldn’t wait to get it written down. I made up the following as an example of the type of story she’d tell. She was walking to the New Orleans Hotel to meet the Ukulele Club in the lobby when she met a tourist in an old Ford with bald tires from a little town in Minnesota. She told the tourist about the old lady that rode a Jersey cow because she had a little dog named Nipper that had been brought to town by old Mr. Miller. When old Mr. Miller died he bequeathed Nipper to the old lady because she always laughed when little Nipper chased his tail whenever someone recited Latin. And, of course, the funny part of the story was that old Mr. Miller had retired from the same small town as the tourist in the Ford with bald tires. And Virginia Tyler regretted that she’d only had a few minutes to talk to the tourist because it was her turn to put out the snacks. Some of her stories are amazing. I hope that the silly rumors that circulate won’t discourage people from seeking out Miss Tyler’s columns. I also hope that when the columns are read and enjoyed that the readers can’t help but feel the same fondness that I have for Virginia Tyler. McKinley Weems asked if I’d ever seen the crocodile-skin purse he’d bought my grandmother. “Havana, Cuba,” was the surprising answer. “You’ve been to Havana?” I asked, suspicious. “Sure, took a cruise there.” My mind went to a Love Boat-type cruise, which didn’t sound like something he’d do. I think my confusion amused him. As it turns out, he and a group of sailors from the local U.S. Naval Reserve unit had travelled from New Orleans to pre-Castro Cuba on a training exercise. As odd as it may seem now, for nearly two decades, Eureka Springs hosted a United States Naval Reserve Electronics Division unit on the third floor of the McVay Building at 55 Spring Street. For the 18 years of its existence, the unit was commanded by Tillman Morgan. He and Forrest Binall, a retired Chief radioman, started the unit in 1948. Harry Hussey was the first Station Keeper. Over time, more than 300 men trained at the unit, coming not only from Carroll County, but also from Bentonville, Harrison and even Point Lookout, Missouri. The medical officer was Commander Neil Compton, the Bentonville medical doctor, who became famous for saving the Buffalo National River from being dammed. My father Donnie Weems was the active-duty Station Keeper for two years. He said that some unit members from dry places, such as Harrison, were attracted to joining because they could get a beer at the Hi Hat while in town for the Wednesday night meetings. As surprising as McKinley’s trip to Havana was, it doesn’t compare to the time we were talking about guns. I knew McKinley had firearms and was a good shot. I’ve heard his aim was accurate enough to win the turkey shoot one year and that he used to hunt squirrels and elk. However, he seldom talked guns like some men do. He told me the reason why: “I’m skittish about guns on account of that time my brother shot me.” I think my jaw dropped open. I’d known him for almost five decades and I’d never heard about this? But, that’s another story.